The fossilised remains of a tiny bird that lived 62 million years ago suggests that birds burst out of the evolutionary gates once their dinosaur cousins were gone, rapidly diversifying into most of the lineages we see today. As the old saying goes, the meek shall inherit the Earth, and this is what scientists assumed happened for birds at the K-Pg boundary. Unfortunately, these feathered creatures, with their brittle and easily breakable bones, don’t fossilise well, and there’s a frustrating fossil gap around this time. That’s why the discovery of a 62-million-year-old bird in the Nacimiento Formation in the San Juan Basin is so important. Fossil remains of the bird are re-affirming what palaeontologists have suspected, but haven’t been able to prove—that little birds dusted themselves off after the asteroid strike, and began a path towards global dominance in the absence of troublesome dinosaurs and other competitors. 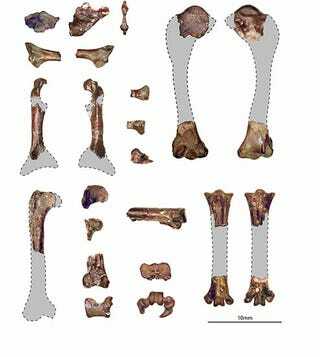 “The fossil provides evidence that many groups of birds arose just a few million years after the mass extinction and had already begun evolving specialisations of the foot for different ecological roles,” noted the authors in their study.